I’ve had a few complaints from readers about the women on the covers of the Captain Lacey books. To some, a woman on the cover signals “romance,” and definitely not mystery. Why this should be, I’m not sure–to me a romance cover has a shirtless male who obviously works out two hours a day and swallows a case of protein powders while he’s at it. If he has a shirt, it’s falling off; and if a female is with him, she’s pushing it off, or he’s pushing her clothes off, or both, or they’re sprawled suggestively in bed. A simple lady standing alone does not shout “romance” to me. However, I do listen to feedback, and the new print covers will be lady-less (with the exception of Hanover Square and Death in Norfolk, which are already in print–print covers take many weeks to change [designer has to redo it first of all] and racks up additional charges for re-uploading and re-printing). The ladies will remain on the e-book covers, but all the to-come print covers will be of scenes only. The Glass House‘s new cover is above as an example of how the covers will look sans females. 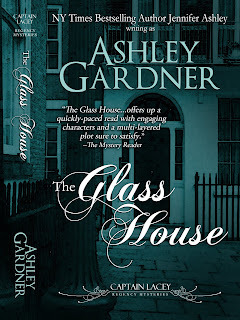 FYI: The background on the cover of The Glass House is a photograph taken by me in London, in St. James’s. Other tourists in London take photos of the stone-still guards or Nelson’s column–I take pictures of doors. I am still working to get all the books out in print; they will be appearing one at a time. I will add links to this site under each book’s page to the print edition: Again, I will use “expanded distribution” so that booksellers can special order them.